Being a repetitive whiner, I've kept on writing, in my reviews of Chefkirk's cdrs, that it'd been great if the prolific US noisemaker explored his more "ambient" or electroacoustic side, rather than the rhythmic noise one. Well, this collaboration with Carl Kruger (unknown to me), released in an unlimited cdr with a wooden frame by German Retinascan, sort of proves me right... We are not informed of who plays what, but I think it's a mix of electroacoustic sounds (possibly obtained via contact microphones or whatever) filtered through various plug ins or analogue devices. Chefkirk's deranged beats surface here and there, but are kept to a (welcome, by me) minimum. Chefkirk had already scattered similar tracks in all his works, but this time the sound palette is much more varied: the really noisy parts are more ferocious, and the "quiet" ones offer more microscopic details and subtle changes. Everything is fast paced and headache inducing in the best Chefkirk tradition, but with a degree of maturity which makes these 45 minutes a pleasant -ahem- listening experience. By the way, all titles are inspired by the Amish community, with a crazy parallel between that form of secluded living and the noise underground. 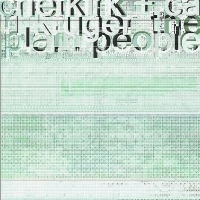 CHEFKIRK & CARL KRUGER - THE PLAIN PEOPLE (CDR by Retinascan) So I wonder if anyone who will get this release, reads the titles, such as 'The Plain People', 'Jacob Amman', 'Menno Simons' or 'Dordrecht Confession Of 1632', will understand that this is a release about the Amish. The Amish live outside 'our' society and rely on nobody. Hence Chefkirk and Carl Kruger saw a connection, as the 'noise' community is also outside the standard of music society. A bit far fetched if you ask me. Chefkirk more than Kruger has earned some recognition in the world of noise, mainly due to his endless stream of releases, of which not all were great. But here in his collaboration with Carl Kruger, things work quite well. There is of course feedback, heavy type digitally distorted rhythms and vague rumbles of electro-acoustica, but throughout it's well enjoyable. There is variation among the lot, among the tracks and even inside the tracks. Perhaps one or two tracks are bit too long, but otherwise: thumbs up! And of course, nice cover, but that's hardly a surprise for this label: they are always nice!